This recipe comes from renowned sustainable seafood chef Cindy Pawlcyn, author of four cookbooks and owner/chef at two Napa Valley locations and Monterey Bay Aquarium’s Cindy’s Waterfront restaurant. Fillets are served with a warm or room-temperature salad that features springtime favorites: small new potatoes, first-of-the-season asparagus, fresh leeks and earthy morel mushrooms. 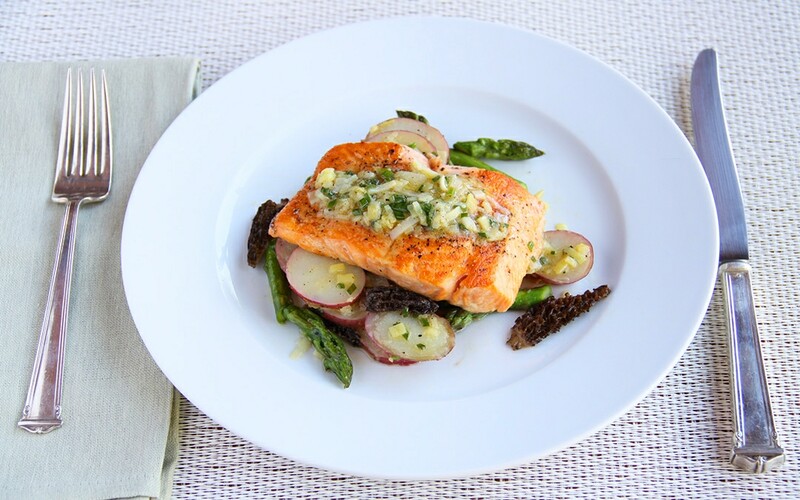 The fish, asparagus and mushrooms can be charred in a heavy skillet, a grill pan or, if it’s warm enough, on a grill. Crusty bread is the only accompaniment needed. End the meal with fresh strawberries and butter cookies. 1. If using dried morels, place them in a small bowl, cover with boiling water and let soak until softened, about 20 minutes. Drain well and pat dry. Combine 3 tablespoons of the oil, ½ teaspoon salt and a generous amount of pepper in a glass baking dish and stir to combine. Add the asparagus and morels and stir to coat. Let marinate while preparing the leek, potatoes and vinaigrette. 2. Bring a medium saucepan of salted water to a boil. Remove the outer 2 layers from the leek. Slice the leek crosswise into thin circles. Place the leek in a bowl of cold water and stir to break up the circles and release any dirt. Lift the leeks from the water and transfer to the boiling water. Cook until slightly softened, about 2 minutes. Using a slotted spoon, transfer the leeks to a fine strainer and drain well. Add the potatoes to the water and simmer until just tender, about 8 minutes. Drain well. 3. Meanwhile, prepare the vinaigrette. Combine the vinegar, mustard and sugar in a 2-cup glass measuring cup or medium bowl and whisk to dissolve the mustard. Very gradually whisk in ¾ cup extra-virgin olive oil. Mix in the chives and leeks. Season to taste with salt and pepper. 4. Transfer the potatoes to a large bowl. Add ¼ cup of the vinaigrette and toss to coat. Cover to keep warm. 5. Heat a heavy large skillet, preferably cast iron, over high heat. Working in 2 batches, remove the asparagus and morels from the marinade and arrange in a single layer in the skillet. Cook until almost crisp-tender and slightly charred, turning occasionally, about 5 to 6 minutes for each batch. Transfer the cooked vegetables to a work surface. Brush the char with olive oil and sprinkle with salt and pepper. Add to the skillet and cook until just cooked through, about 2 minutes on each side. 6. Cut the morels lengthwise into bite-size pieces. Cut the asparagus stalks on an angle into 1½-inch pieces. Add the morels and asparagus to the potatoes. Add enough vinaigrette to season to taste and toss to combine. Taste and adjust the seasoning. Divide the salad among 4 plates. Peel the skin from the char. Arrange one fillet atop the salad on each plate. Spoon the vinaigrette with leek atop fish and serve right away.